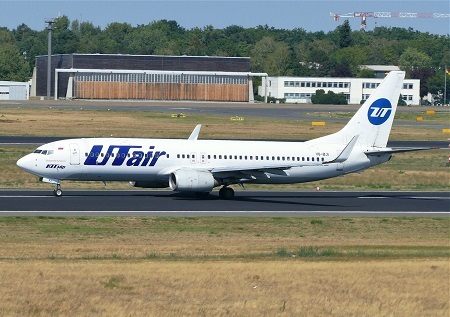 UTair flight UT579 took-off at Moscow-Vnukovo Airport and was descending to Sochi-Adler Airport (URSS). Landing runway in use was 06 requiring an approach over the Black Sea. It was dark at the tme (about 02:30) and local weather consisted of rain showers, associated with thunderstorm activity and a wind shear alert was issued for all runways. Air Baltic flight BTI456 (a Boeing 737-300, YL-BBR) from Riga was flying 3 minutes ahead of UT579 but forced to abandon the landing on short final approach. 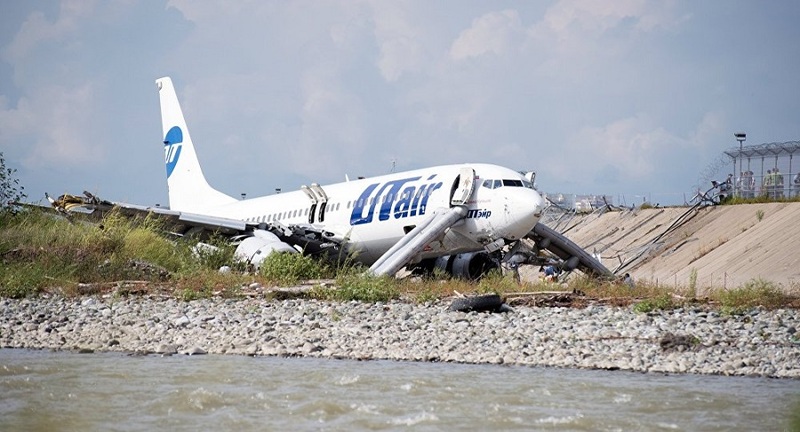 UTair 579 also discontinued the approach about 5 miles out and both proceeded to a holding area over the sea. 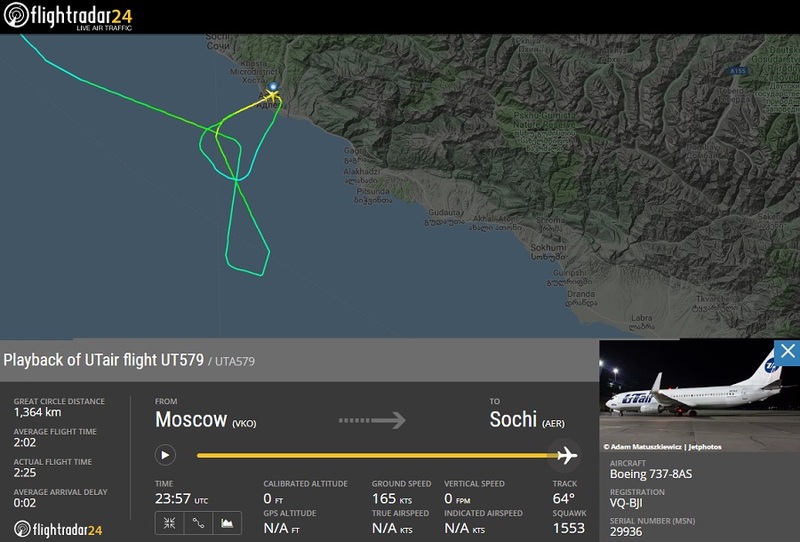 At 02:49, Utair579 attempted a 2nd approach to runway 06 but had to go-around over Sochi Airport apparently because of the inclement weather situation. At 02:54, BTI456 attempted a 2nd approach to runway 06 but had to perform another go-around. 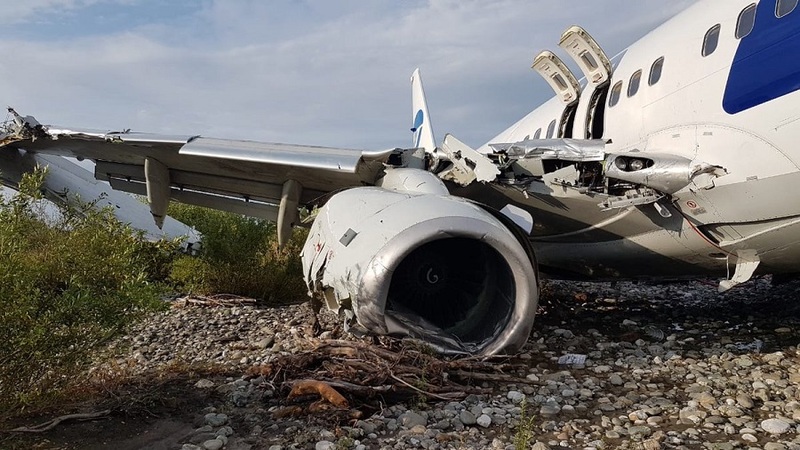 At 02:57, UTair579 attempted a 3rd landing approach to runway 06, this time the aircraft touched down but the pilots were unable to stop the aircraft before the end of the runway. At the end of the runway, the pilots pulled to the left and the 737 slid sideways. 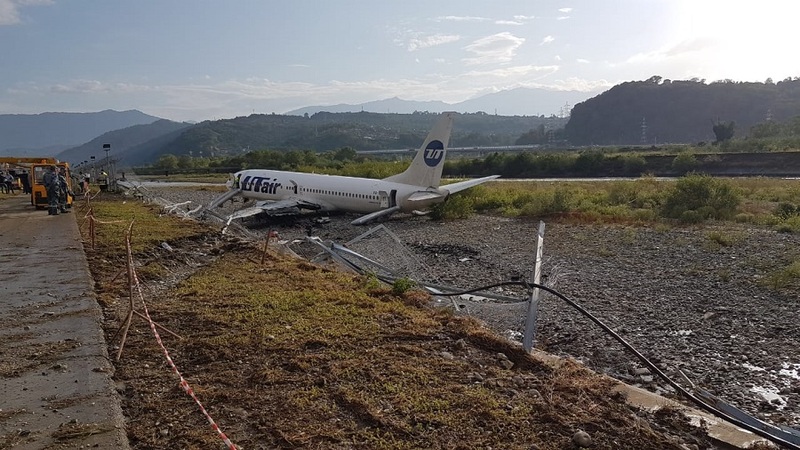 The aircraft crossed the airport perimeter fence and fell about 2 meters down an embankment into the bed of Reka Mzymta river. The river runs immediately to the east of the aerodrome. 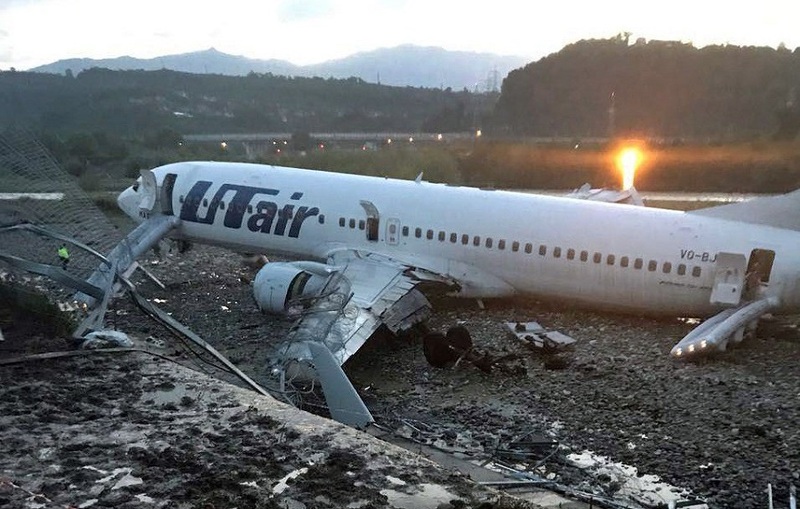 Luckily the area where the 737 came to rest was not flooded at the time. The right outer wing broke and fuel tanks were ruptured resulting in a fire. The nosegear and left maingear were torn away. 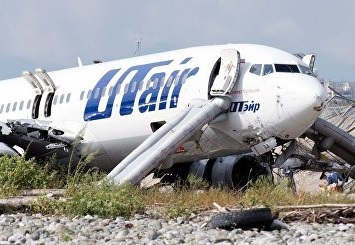 Foreward fuselage, the entire left wing, and both engines also received severe damage. The extent of damage is beyond repair. All 170 managed to evacuate safety via the L1, L2 and R1, R2 slide exits as well as via the left + right overwing emergency exits. Local authorities reported 18 injuries but none of them was in critical condition. The following day it was reported that a rescue worker has died because of a heart attack. AirBaltic flight BTI456 safety diverted to Krasnodar Airport. Runway 06/24 is 2890 meters (9,485 ft) in lengh. Runway 06 is lacking any overrun capabilities. 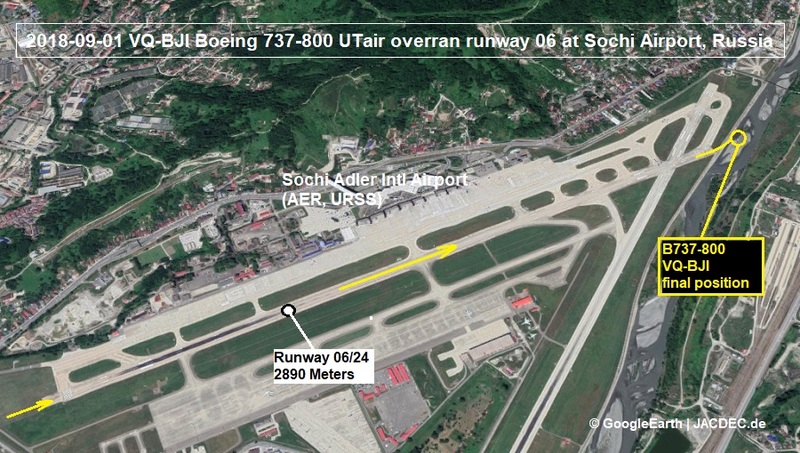 NOTE: An extension to runway 06/24 was planned in 2007 to accommodate larger traffic for the upcoming Winter Olympics in 2014. Therefore the runway was to get extended by 600 m to 3.500 meters comprising a bridge over the river and a widened turning area at the. But this project never came to fruition.